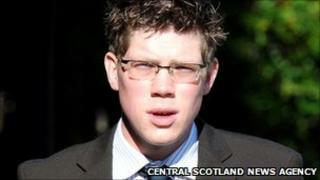 A football fan who set fire to a rival supporter who was dressed as a sheep is to pay his victim £25,000 in compensation. Hibernian fan Peter Wallace, 24, of St Andrews, set Aberdeen supporter Arjuna Rabindranath alight on a train. The victim, also 24, suffered serious burns and needed extensive treatment. Wallace admitted culpable and reckless conduct, and agreed to pay the compensation when he appeared at Kirkcaldy Sheriff Court. The incident happened on an Edinburgh to Aberdeen train last October. The pair were among fans, many of them in fancy dress for Halloween, returning from Aberdeen's SPL game at Hibs. Wallace - heir to a farm said to be worth millions of pounds - repeatedly flicked his lighter near Mr Rabindranath's costume, which comprised a white tracksuit and cotton wool. Depute fiscal Mark McGuire told the court: "People heard screaming and saw a man on fire running about." One of the passengers described it as "like a scene from a horror movie". People threw drinks to try to douse the flames, but without success. The court heard that Wallace later approached police at Kirkcaldy railway station and said: "It was me. I was just mucking about with a lighter and accidentally set fire to the man." The victim suffered serious burns to more than 40% of his body, and there were fears for his life. He remained in hospital until January, when he was discharged at his own request, into the care of his mother. David Bell, defending, said Wallace had a previous football-related conviction which was dealt with by a fine. Mr Bell explained: "He met Mr Rabindranath on the train and they talked in good humour about it. "He asks himself now what Mr Rabindranath must think of him, after his life was turned upside down. "He has written to him apologising. It was a stupid and reckless act." He said a jail sentence would have a catastrophic effect on the farm and his family. Mr Bell said Wallace would be "happy" to pay compensation. Sheriff Grant McCulloch ordered Wallace to be admonished, in addition to making the compensation order. He told Wallace: "This case is tragic not only for you and your family, but for the effect it has had on the victim. It has been catastrophic for him. "This incident again shows the dangers of playing with a naked flame. "I accept you didn't want to cause harm - this is more like a terrible accident." The sheriff added: "Your behaviour since has shown a level of maturity and I have seen your letter to the victim, and it is very sympathetic. "I accept you are unlikely to offend again, and there would be no benefit in imposing a custodial sentence." Wallace left court without comment. Ch Supt Ellie Bird, Scottish area commander for British Transport Police, said: "Everyone should be able to travel on our trains without the possibility of encountering such dangerous actions. "Our thoughts remain with the victim, and hope that he is able to move on after today's court judgment."